This special designer cake will help you express your heartfelt love for your loved ones. 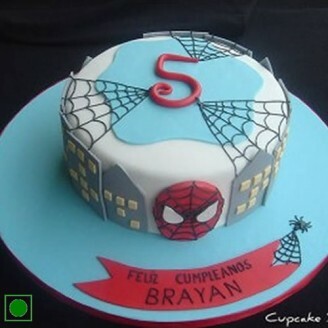 This cake is designed as a Spiderman and thus the fans of this superhero would find this cake an enthralling one. So, what are you waiting for.? Place an order now and mesmerize your loved ones on their special occasions. •	Send this Amazing Spiderman theme cake for your loved ones today and give them an awesome surprise. •	Present this scrumptious cake to give your children a reason to smile by ordering a Spiderman cake for their upcoming birthday party. •	Delivered merchandise – cake design may vary with the images shown above.